Our God is a deliverer and Savior! He promised, he fulfilled, and he delivered us from sin and evil. Over and over again, God has come to the rescue of his beloved mankind. When he brought the final plague of death on the firstborn males of the Egyptians, he provided a means of protection for his people. Through the celebration of the Passover, God gave the Hebrews a means to remember his love and grace. After man had sinned, God promised a savior. Through Jesus Christ, God fulfilled all that was promised. He delivered his own son, Mary’s firstborn son, as the final sacrifice for our sin, and then resurrected him, making the victory over death complete. He brought freedom and forgiveness to all mankind, and instituted Holy Communion to remind us of his grace and mercy forever. In Jewish culture, it took only two witnesses to legally verify something as true. In the case of Jesus’ resurrection, there were always more than two witnesses, including more than 500 at one time. Jesus’ enemies bribed guards to try covering it up, but they were unsuccessful. 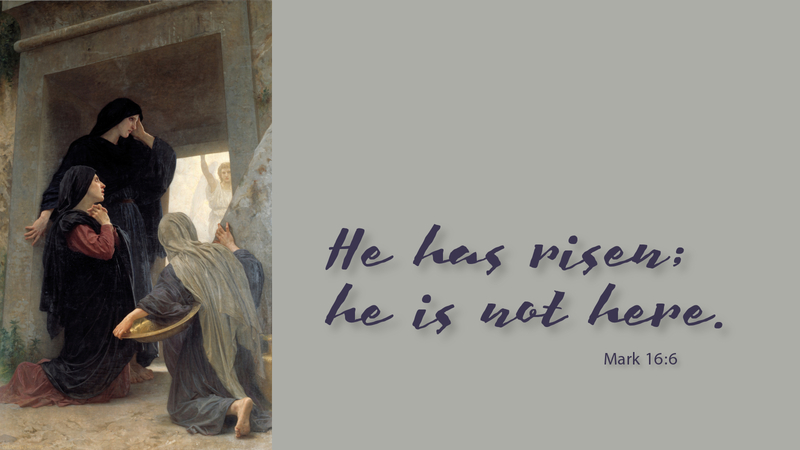 Jesus died; Jesus rose again; Jesus saved us all! Prayer: Lord God, accept my heartfelt gratitude for your gift of grace and forgiveness. Amen. Today’s devotion was written by Kris Brower, pastor of St. Matthew Lutheran Church, Brenham, TX.